When it comes to wooden ladders,most of us are under the impression of the unique aesthetics of a natural material, even in the head does not come to call the wooden staircase just a design for posts floors. Rather, it will be called a significant element of the interior decoration indoor decoration, almost a symbol of respectable life! Indeed, curved handrails made of wood to wrought iron fences ladders or intricate carvings on the balusters can be very impressive, but it is worth mentioning the unique texture of natural wood, natural picture tree rings and stunning shades of color? 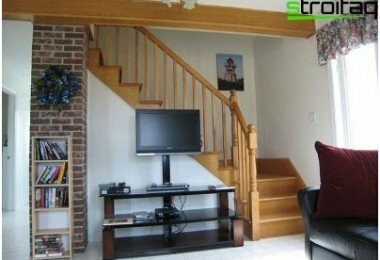 Surprisingly there are a variety of wooden stairs - photo collection of the most interesting in our opinion offered options below. 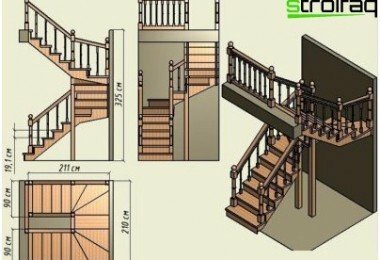 Presented at the photo wooden stairs with their hands to make quite difficult, because apart from specific knowledge of wood processing skills to design and calculate the design will need expensive woodworking equipment. Production of stairs made of wood requires mandatory of engineering calculations, because the ladder carries a certain load, it is important to consider the location, configuration, angle. 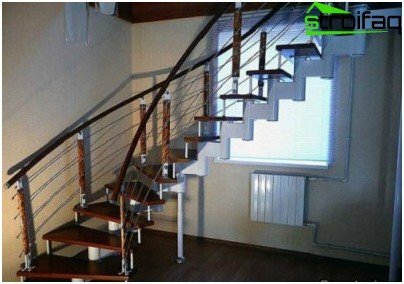 Perhaps a different arrangement of wooden stairs. There are wooden stairs completely, as well as containing the basis of metal or concrete base, outside sheathed wood. 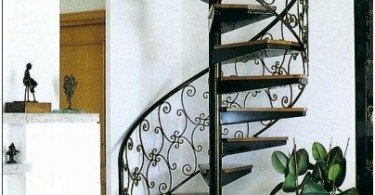 A metal staircase with wooden steps and railings can be instead of balusters decorated with wrought pattern. Wooden stair treads can also be different not only in size and shape but, for example, in the case of designing a rotary ladder. Any ladder regardless of the type of construction andthe material from which it is made, includes the main (bearing) and secondary (fine) elements. The main elements include steps, stringers, bowstring, supporting pillars. For decorative - balusters, handrails, podstupenniki, fittings, decorative console and others. When choosing a ladder complex configuration, beready for some difficulties in everyday life: for example, it will be difficult to move the ladder bulky furniture. Do not skimp on the fence, it is rarely placing balusters: considered the safest distance not exceeding 15 cm. 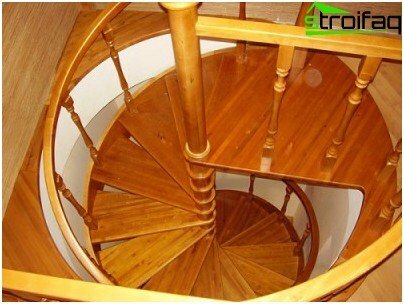 Consider the design features of various types of wooden stairs. 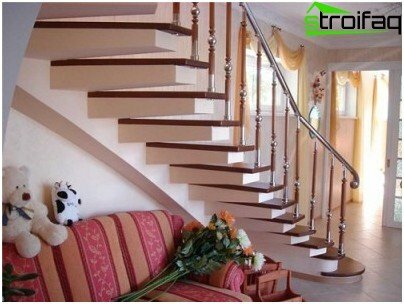 Open staircases made of wood different mostsimple design, consisting of separate marches. There may be some stairs and straight and turning. 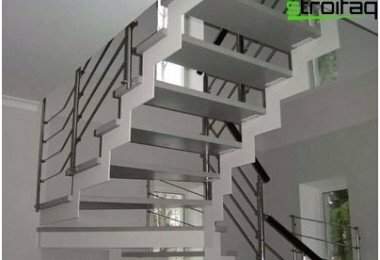 Precast concrete staircase with straight marches "wood" in the truest sense of the word can not be called: rails, balusters and stair treads made of wood and concrete base. 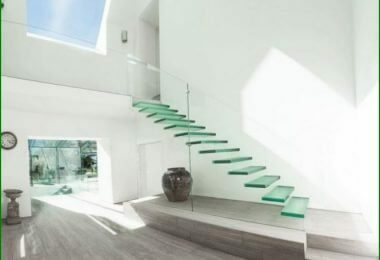 The design of cantilevered stairs difficult,the location along the wall and the absence of massive handrails and visible pillars creates the impression of an imaginary "hanging in the air" design. In fact, reliable fastening wooden steps anchored to the supporting wall provides the necessary stability and strength. Replacing the flooring in the room with the ladder does not require the dismantling thereof, which may be called the undisputed advantage. Spiral staircases can not be called the most comfortableoperation, but this option is best suited for interior space deficit. Combined ladder typically includes curvilinear elements, straight and helical marches. The cap ladder so named for asimilar to the backbone: indeed, consisting of individual elements of a structure connected by a serial insert except spinal difficult to call. The use of this design allowsalternation of planning decisions (straight, spiral, turning stairs with zabezhnymi steps), which gives an opportunity to get a ladder almost any geometry. The form of fences, of course, follows the shape of the construction of wooden stairs, hence the need for a flexible handrail. 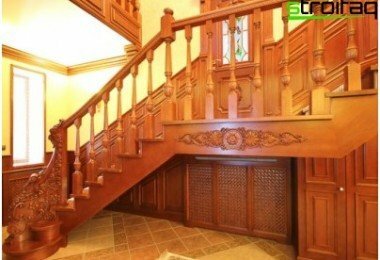 Production and installation of wooden stairs spinal type will cost half to two times more expensive than the classic version. 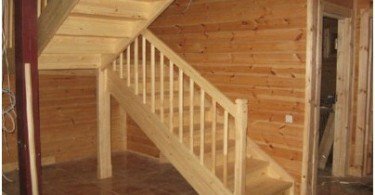 Production of wooden stairs with their handsIt requires a careful examination of available information on the subject and responsible attitude to the choice of materials. When selecting the fluid for toning note on its purpose. The choice of protective or toning composition designed to protect the wood from moisture and biological effects outside of premises, can cause allergies (at best). The varnish and toning designed for furniture or flooring will be safe for households. Painting ladder parts must be carried out inclean room, of course, not a brush, and using a spray gun. 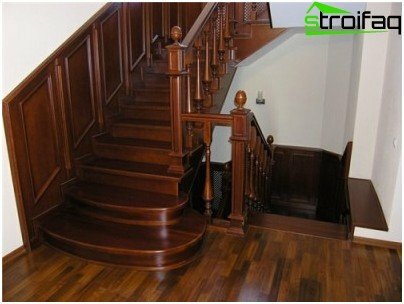 Building wooden stairs should be made after the color of its parts, and after the completion of construction work in the room. Using wood in the production of stairs, furniture or flooring, be prepared for the need to maintain a normal temperature and humidity. Otherwise, the material will react to increase the size of geometric deformation humidity parts from wood can crack from dryness increasing temperature. Production of stairs made of wood hardwoodjustified, first of all, the characteristics of natural materials: beech wood, maple, ash or oak is highly durable, resistant to shock and mechanical stress, the use of softwood is justified in the case of the production of stairs for poorly heated country house. Softwood less, resistant to temperature changes, but because of the resin in the wood, less valuable in ornamental terms. 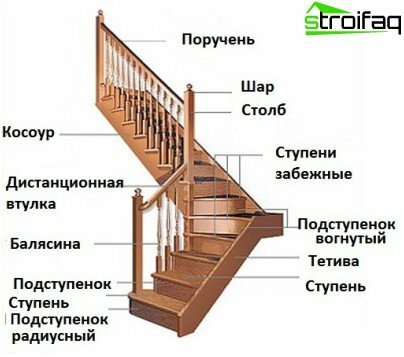 Construction of wooden stairs various forms,fastening means, presence or absence of decorative elements. Studying materials on how to make a wooden ladder to objectively assess their capabilities. You can find reliable information on how to make a wooden ladder, but be prepared for a complex hard work. You are sure to encounter the necessity of engineering calculations, with difficulties in selecting the best material for manufacturing, with the intricacies of selection of color shade in desired interior scheme.